The Triple E New Construction program is based on the concept of a roadmap to achieve energy-efficient construction and design through specific thermal and performance standards and to encourage the right application of heating, cooling, water heating, lighting and appliance opportunities. Triple E helps improve the energy efficiency of new residential homes; Triple E homes average a 25 percent reduction in space heating costs compared to conventional new homes. Not building all electric? 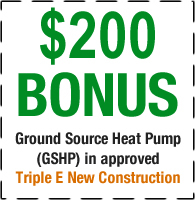 Click here to see other benefits and rebates you can take advantage of with the Triple E program. "This is the first house we have built, and it probably will be our last, so we want to do it right. Our goal is to live in an energy-efficient home with manageable heating and cooling costs." Homeowners and builders can qualify for special incentives up to $2,000 by meeting specific energy standards in new homes where electricity is the primary heating source. These standards cover thermal integrity (insulation, windows and doors, exterior wind barriers), airtight construction, moisture control, appliances, lighting, ventilation and heating system performance for air and water. Homes built to Triple E standards provide the homeowner with lower energy costs, a healthier indoors, improved building durability and increased market value. Open to all residential new construction built in Minnesota Power's service area with electricity as the primary heating source. Customers may use a contractor of their choosing, build the home themselves, or find a contractor on our existing Triple E builder’s list. Meets lighting and appliance standards. Complete the three-phase inspection process and a final performance-based evaluation. Note: For more information on Requirements to Participate, click here. Work with your builder to develop an action plan for achieving Triple E designation based on the road map. For general information about the Triple E New Construction program or if you have decided you want to build your house to meet Triple E standards for long-term comfort, cost control, durability and value, contact Chad Trebilcock at 218-355-2206. To order a Triple E New Construction Guide, click here. Why Build a High Performance Home?